With all the buzz around customer experience (CX), it can be difficult to identify the most important CX best practices. That could be why CX initiatives don’t seem to be delivering their promised results—yet. According to a recent survey from Customer Think, just 23% of respondents felt that their CX programs delivered tangible results. What can CX professionals do to reverse this trend? Our investigation into CX best practices among Fortune 500 leaders in the U.S. and Canada offers some answers. 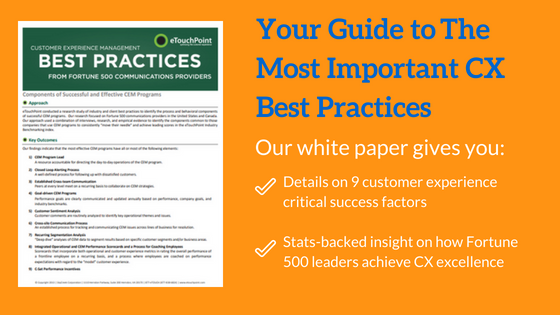 We discovered nine critical success factors that—when followed—form the foundation of a solid CX program. The #1 factor on our list is naming a specific individual to lead customer experience efforts. This person will be accountable for leading day-to-day CX program operations. Right now, many organizations are lacking in this area. Research from the Customer Experience Professionals Association (CXPA) and West Monroe Partners found that a quarter of companies do not have anyone dedicated to CX. Another recent research finding underscores the depth of the disconnect. Just 1/3 of companies say key stakeholders are truly on-board with CX program goals. 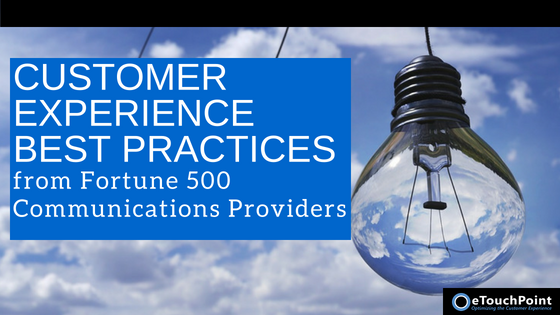 For more insight on proven practices that lead to CX excellence, download our white paper “CX Best Practices from Fortune 500 Communications Providers.” The insights you’ll gain are directly relevant across multiple industries—and can help you chart a course to greater CX success.